No matter how good our copiers and printers become, it seems that we still have no solved the issue of the pesky paper jam. It’s part of life that every office worker across the spectrum has to deal with at least once. And, no matter what, it will always seem to happen at the worst possible time. 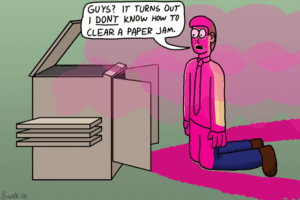 That’s why we believe that it’s so important to learn the basics of how to fix a pesky paper jam. Fixing a pesky paper jam is actually a relatively easy skill. The most important thing to remember is to stay cool, even if you are interrupted in the middle of a stressful project. If you are not careful with your machine then you can cause bigger, more expensive repairs to be done. Find the source of the jam. Look to see if you can find what’s causing the issue. The troublemaker will usually be in the paper tray. Look for crumpled paper or any sign that something may be stuck. If you don’t see the solution in the paper tray then you may need to go inside the machine. Remove the jam. Gently take the paper and work it out of the machine. Do not yank or aggressively pull on the paper. This can cause it to rip and be harder to get out. It can also harm other parts of the machine. Double Check the Copier. Make sure that you removed all the pieces that could cause a jam. Make sure that your paper didn’t rip, leaving small pieces on paper inside the copier. Run a Cleaning Program. This will clear the brushes of any excess miniscule scraps, and dust. If you follow these steps then your copier should be up and running in no time. If you follow these steps and still can’t find out what’s wrong then it may be time to call the experts at Copier Seattle.